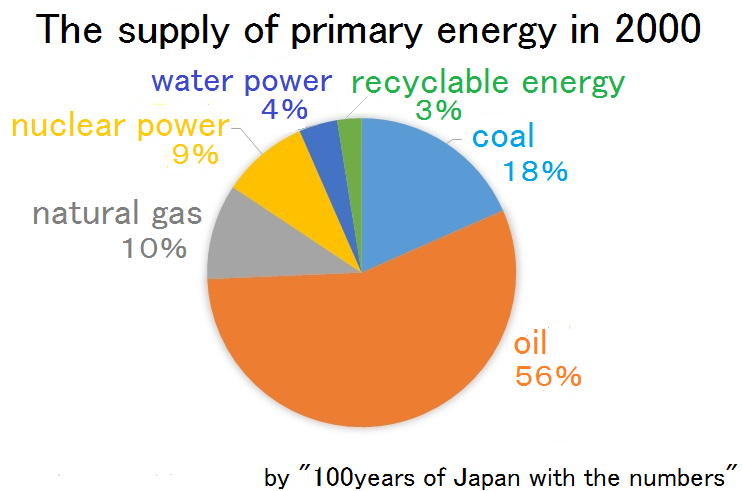 Let's study the history of energy in Japan! Yuppy: Chamiko, let's think of Future Plan quickly! Chamiko: Wait, wait, Yuppy. 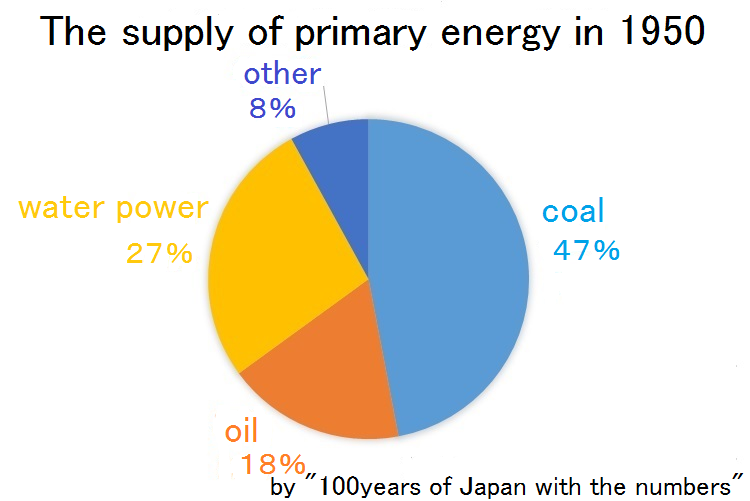 Before thinking of Future Plan, we have to know well about the history of energy supply in our country. . How much do you know the situation of energy supply in Japan? Chamiko: Oh, that's OK. I understood we have to study from scratch…By the way, how did you come to meet us? Yuppy: Time Leap! You can go to whenever you like by using this power. Chamiko: That's great! Then, let's set out on a time travel to learn about the history of energy in Japan! Chamiko: Look, this is our schedule of the time travel. The Nabeshima han began to produce coal with machine. The amount of total coal production reached 10,000,000 tons. The amount of coal production a year was the largest in history of Japan, 5631 tons. Priority production system (See the section, [Postwar ~ Rapid Economic Growth Period]) of coal was introduced in order to activate coal industry. Japan owned the first oil field at Khafji. OPEC (Organization of Petroleum Exporting Countries) was founded. Primary coal policy was introduced. The first nuclear power plant in Japan, (Tokai 1st nuclear power plant) began to work. Japan began to import Liquefied Natural Gas. "Act on the promotion of the development and introduction of alternative energy" was established. The last coal policy was introduced. Mitsui Miike Coal Mine was closed. Japan lost Khafji Oil Field. Main coal mines in Japan were all closed. Fukushima Daiichi nuclear power plant was abolished. Chamiko: Don't worry. Let's go to some historical moments! Yuppy: We made it! When is it now? Chamiko: It's the time which my grandmother is still a child. Yuppy: Many towns are destroyed… Is this really Japan? Chamiko: The war has just finished… But, Japan revives the economy in this hard condition, using a lot of coal! Chamiko: After the war, Japan introduced "Priority production system (1946)", which means giving priority to securing workforce, funds and materials necessary to activate the coal and steel industry (Referred to "100 years of Japan with the numbers"). Thanks to this policy, Japan could revive the economy. In 1956, the economic white paper said, "It's no longer termed postwar." Yuppy: Wow, Japan made great efforts! Look at the graph, and you can understand coal was the main energy source at that time. Chamiko: That's right. However, it changeds a lot during *Rapid Economic Growth Period. Chamiko: The main energy source was shifted from coal to petroleum, because a lot of cheap petroleum began to bewas imported from the Middle East. 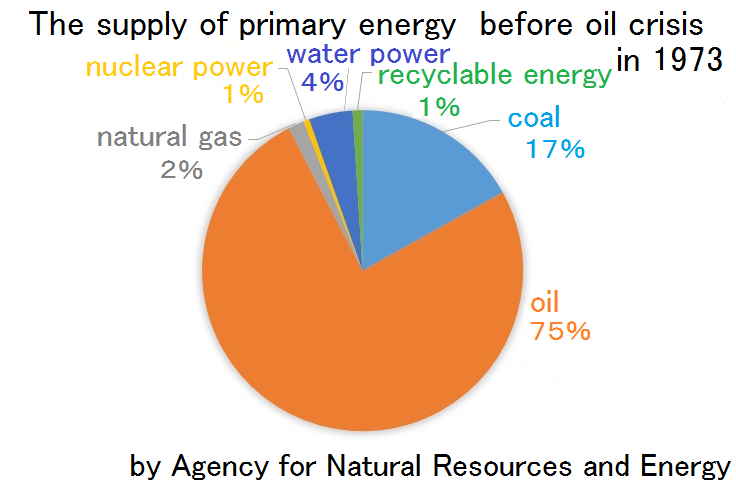 In 1961, the amount of the supply of petroleum as the primary energy exceeded that of coal foe r the first time. It's called Energy Revolution. Chamiko: Yes. Though The dependence on imports of energy was only 43.3% in1960.,It exceeded 80% in 1969. Yuppy: But, why is it bad with us? Yuppy: Oh, no! Many people are scrambling for toilet paper! What's happened? Chamiko: Oil Crisis. In 1973, Forth Arab-Israeli War made many oil-producing countries reduce the supply and raise the price of oil, and it caused First Oil Shock. The price rose about 3.6 times by Januaryby January 19743?? ?January next year, so many developed countries depended on cheap oil fell into the depression. Yuppy: It had a bign impact on around the world! I understood it's not good for us to depend too much on the Middle East. But, why did heavy buying of necessities of life happen?many people tryied to buy a lot of necessities of life? Chamiko: It is because the false rumor that paper would disappear by Oli Shock was spread. Japanese were used to mass consumption during Rapid Economic Growth Period, so the lack of things was very terrible for them they feared the lack of things very much. 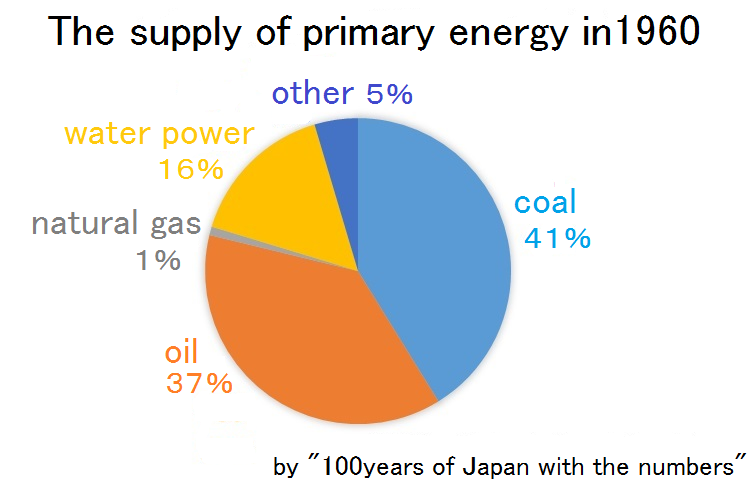 Through First Oil Shock, Japan put an importance on securing stable supply of energy, and in order to improve energy system, Japan launched the policies as follows. Yuppy: Since then, the government has been conscious of saving energy and alternative energy sources have been conscious! Chamiko: You're right. Japan took measures correctlyright measures to deal with First Oil Shock, so there was not a big impact of Second Oil Shock in 1979. Chamiko: Look at these graphs, and you can understand that the proportion of petroleum as the primary energy had been decliningdrastically declined after Oil Shock. During this periodIn this period of time, nuclear power, natural gas and coal took an important role as the alternative energy. Yuppy: Japan seems to be able to make it through in this way! Yuppy: Oh! There is an earthquake The ground is shaking! Chamiko: Be careful. It's March 11th, 2011, when Fukushima Daiichi nuclear disaster happened. Yuppy: Oh, I've known it. Many robots like me worked to investigate the nuclear contamination and the situation of the destruction in the stricken areas. Chamiko: That's right. 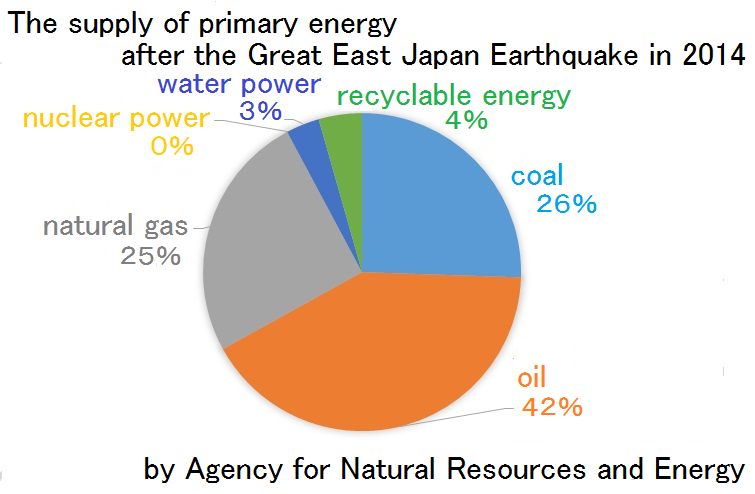 Nuclear power had been expected as the important alternative energy, but since then , almost all nuclear power plants in Japan werehave been suspended. I was 11 years old then, and I experienced rotating blackouts. I learned that we should not think the stable supply of energy as ordinary thing throw away the belief that we can get stable energy. 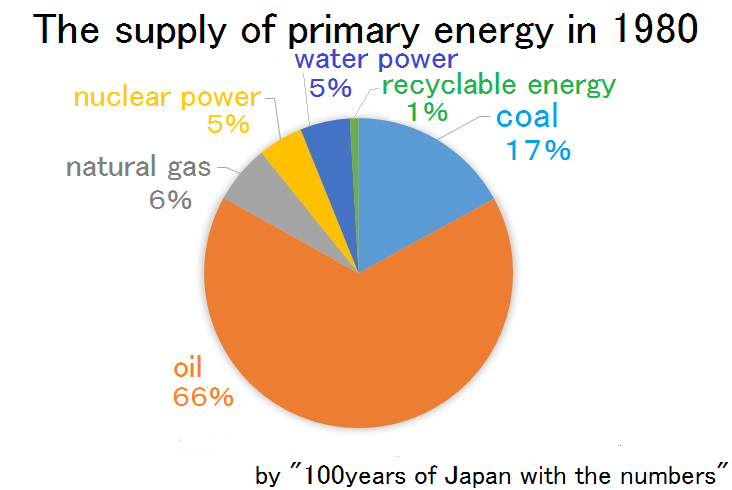 And most Japanese people began to suspect the safety of nuclear power, so we can say it's a big turning point of energy. Yuppy: We got back to today. Chamiko: Yuppy, through this time travel, what do you think is necessary for the future of energy circumstance in Japan? Yuppy: Hum… If we continue to use a lot of fossil fuels, there will be a large number of environmental destruction and petroleum wars like in my brokenblack future. We have to prevent change that future. Chamiko: I agree with you. In order to realize it, I think we must get a lot of information from different sources and discuss the issues with people in the world so that we can consider them from various points of view we have to consider solutions globally from more globalvarious points of view . Don't think the stable supply of energy as ordinary thing We should throw away the belief that we can get stable energy. We are responsible for using energy properly, considering the environmental problems according to "*1 Kyoto Protocol" and"*2 Paris Agreement". Furthermore, we need to establish the liberalization of energy, and develop the efficiency of energy so that people around the world can get energy more equally and conveniently. Our generation should take the lead to improve the future! Yuppy: We all can make the most of natural resources! Chamiko＆Yuppy: Then, let's think of Future Plan! 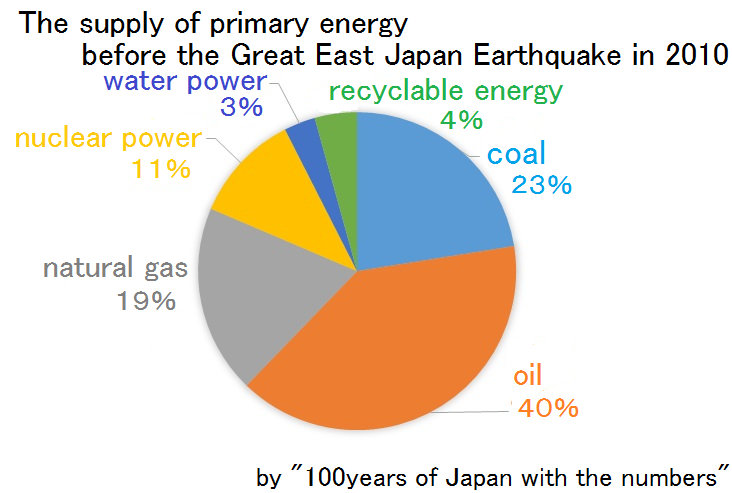 Let's study the history of energy in Japanenergy history of Japan!